Prom time is coming and it's high time that seniors decided what to wear and what hairstyle to choose. Recent catwalk events were full of side hairstyles: side braids, side ponytails, side updos and buns. And yes, this side hairstyles really came into trends now. These hairstyles fit best of all evening cocktail dresses especially the ones with open neck and shoulders as they accentuate greatly the beauty of these parts. Keep in mind that your hairstyle should complete your evening gown, and it shouldn't be bold and too modern, cause on the photos some 20 years later you must still look fashionable. 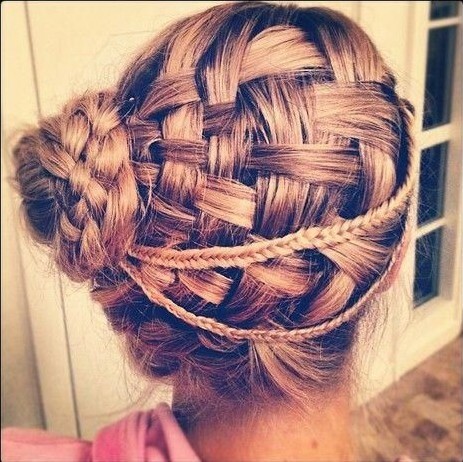 So now it's time that we turn to side hairstyles for prom and see the flattering designs by pro hair stylists. Side hairstyles are created for long hair in first place.But with medium length hair it is also possible, just opt some hair extensions. Don't forget to use hair accessory: a chic brooch or hair clip will underline your amazing hairstyle. The following selection of best side swept hairstyles for prom will inspire you to choose your own style and image for the coming big party. Such braided updo looks much like a chess desk and it will be very suitable for a prom, cause it seems to remind about intellectual gaining you acquired during years at school. This neat hairstyle with defined lines has one important thing - an incredible side bun, that looks really gorgeous and very elegant. Keira Knightley's romantic hairstyle is very feminine, the twisted style mostly spread on one side and a few strands left out makes the image incredibly romantic. This glorious hairstyles with waves creating the side bun will look awesome, especially when completed with chic hair clip like the orchid brooch on the picture. Side updo hairstyle with curly strands, some left out to make you playful and flirty. The natural looks of such a side updo will conquer everybody's heart. Simple and classy curls moved on one side! This makes such long side hairstyle very elegant and classical. Looks natural still very polished.